This has to be one of the cutest yarrows that I've ever seen. Barely reaching six inches in height (on a good day), its grayish fernlike leaves are covered in dense hairs from head to toe. 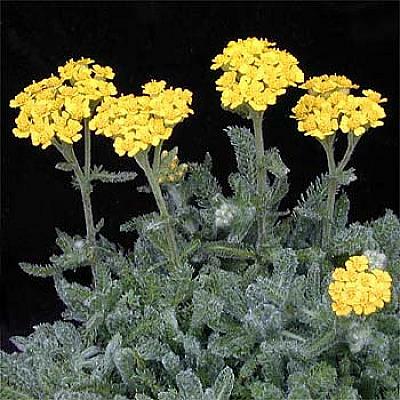 In the summer it produces two-inch wide flat-topped clusters of canary yellow flowers up to six inches above the foliage. They're great for vases because they last so long, but I like to leave them outside to attract butterflies. Besides being fuzzy to the point of being adorable, the leaves have two other qualities: they're evergreen and have a pleasant scent when rubbed. They're great in rock gardens or planted between stepping stones; in fact, I've read that they feel great on bare feet. I can just imagine! Make sure that you give them lots of sun and well-drained soil, but they can tolerate dry to medium wet conditions.